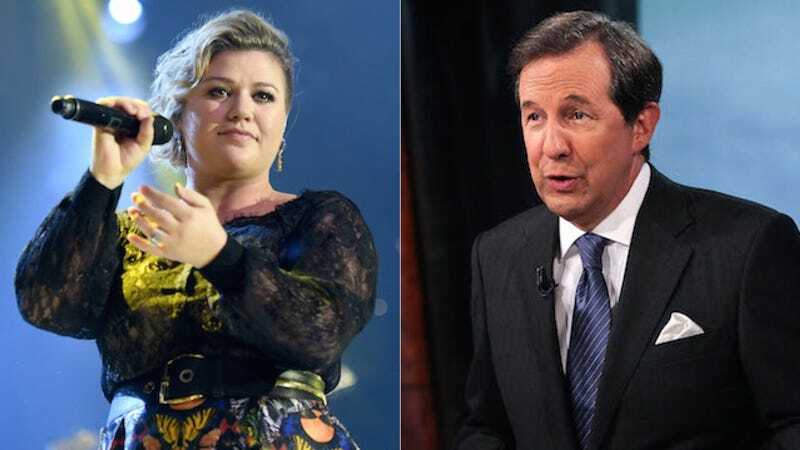 Taking a break from harassing the three billy goats gruff, Fox News’ Chris Wallace has emerged from under his bridge to apologize to Kelly Clarkson for making rude comments about her weight. Originally, Wallace, appearing on The Mike Gallagher Show, remarked that Clarkson “could stay off the deep dish pizza for a little bit.” While Clarkson could not care less about Wallace’s opinion of her, others—even Fox News’ Queen Chupacarba—were angered on her behalf. “I sincerely apologize to Kelly Clarkson for my offensive comment. I admire her remarkable talent and that should have been the focus of any discussion about her,” he told US Weekly on Sunday. Well, that’s good. Wallace’s body-shaming was really taking away from the racist/homophobic/sexist/jingoistic enjoyment that I usually get get from watching Fox News, so I’m glad that’s finally settled. Back from his vacation with ex wife Gwyneth Paltrow and their brood, Chris Martin is taking Jennifer Lawrence on dates all over the Northeast. On Saturday, the pair met for a day in Central Park, starting with lunch at Tavern on the Green, followed by a walk through Strawberry Fields.